Takes you through a new Christians' first week and beyond, establishing a lasting framework for discipleship. Tim Hawkins has a passionate vision - not only for outreach to young people, but also for seeing new Christians grounded in the faith and growing to maturity. Rooted in Scripture, this book shows how both Jesus Christ and the apostle Paul went about the task of growing disciples - and how their methods and mindset form the basis for effective discipleship today. This manual for youth leaders is packed with insights from three decades of experience. Starting from the point someone responds to the gospel, it takes you through a new Christians' first week and beyond, establishing a framework for a practical approach that brings gospel growth to young disciples. 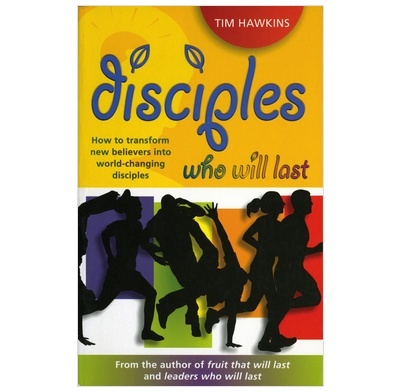 Disciples who will last aims to help youth leaders everywhere to teach and grow young Christians, so that they too will one day grow disciples for Christ. 1. Why building lasting disciples matters! 5. Get the gospel right! As someone with a passion for developing disciples who will last, I obviously liked this book. It was in many ways rather basic - there were no surprises in the content, and most of it was just good, biblical sense. However, it was very handy having all those reasons that you know at the back of your mind spelled out in front of you, with a checklist of things to do. Section 1 looks at the methods of Jesus & Paul in spending time with individuals in order that they can spend time with others. Section 2 outlines the importance of the gospel, and talks through how to lead a person to Christ. Sections 3-5 are more practical and include advice on group sizes, frequency and content. I would particularly recommend this book to (or place in the hand of!) someone new to discipleship, or beginning to take a more involved role in 1:1 or small group work with young Christians.